Despite still seeing low temperatures in the 30s overnight and some nasty wind chills, it seems that things are beginning to shift towards spring. And with warm weather comes the itch to not only drive my car, but to tinker with it as well. Thinking that the changes to my car this winter were going to be virtually non-existent, I was pretty confident my car would be sitting around fully assembled in the garage awaiting the first 50+ degree day to make an appearance on the streets. But, in typical Damon fashion, a couple of thoughts quickly snowballed into a number of updates being made to my car for the 2016 season. The front fenders on my S13 have always been imperfect in one way or another. I’ve had a couple different pairs painted and installed during the course of my ownership, but there’s always something wrong with them. Dents from the roll job, dings from the car being bumped into in the garage, and cuts in the metal from even worse roll jobs. 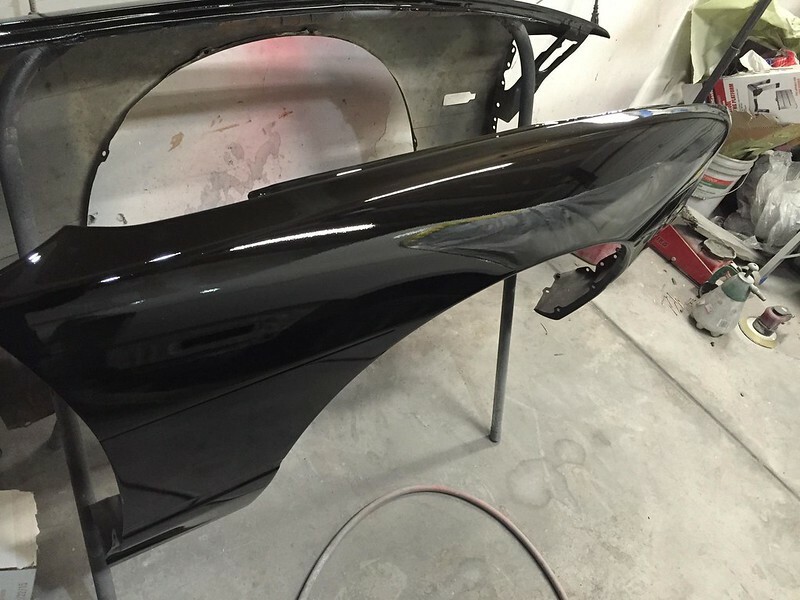 I finally bit the bullet and picked up a pair of rolled and near-mint fenders from a friend that was installing FRP front fenders this winter, had them smoothed and cleaned up professionally, and then painted. 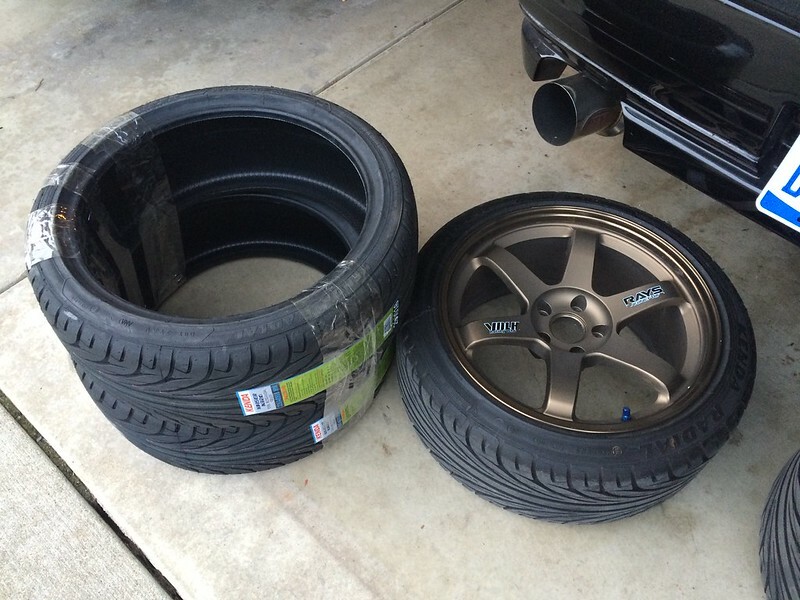 With those fresh fenders completed and awaiting pickup at a friend’s house across the state, I began to have second thoughts about ruining them during the reinstallation of my Hot Road aero kit. Due to the front bumper being a one piece design, it’s virtually impossible to install it without scratching or chipping the paint on the front fenders. The kit fits extremely well for aftermarket FRP aero, but there are a number of areas where rubbing, cracking, and sagging are inevitable. 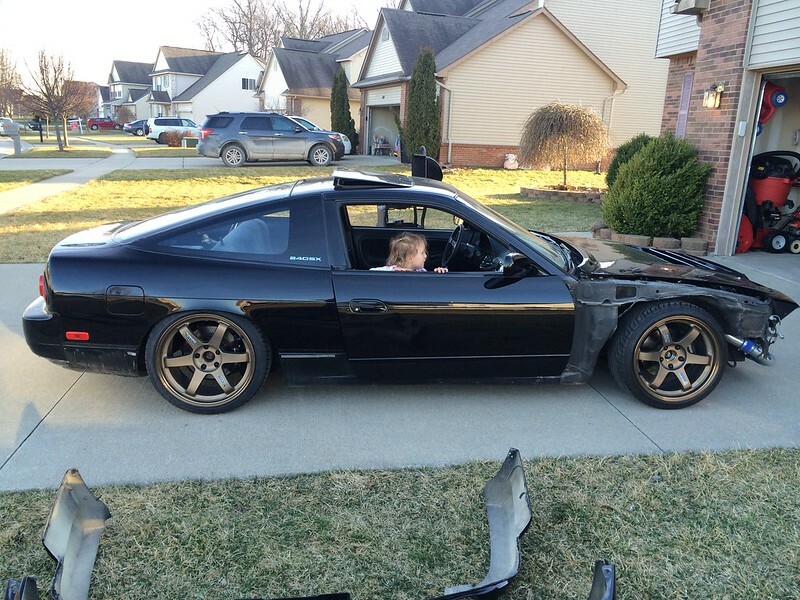 While I love the look of the Hot Road kit and had wanted to give it a shot for years if the opportunity to own it ever manifested itself, there were times where I didn’t like the overall look as much as OEM kouki 180SX aero. The front bumper looks pretty nice with the group A vent in the center, but always felt higher off the ground than the factory kouki 180SX bumper and lip. The exaggerated one piece side skirts are aggressive and look great from a lot of angles, but also look odd at other times. They also hang a bit lower than the front which bugged me. The rear valence was just about perfect in my eyes, but that had a tendency to look strange and out of place to me as well from time to time. Ultimately, despite the disapproval of a few of my friends and the internet at large, I sold my Hot Road kit to a young guy from Ohio a couple weeks back. He drove up nearly three hours to pick up the aero and was a really cool dude, so I feel great about making the decision to sell it. 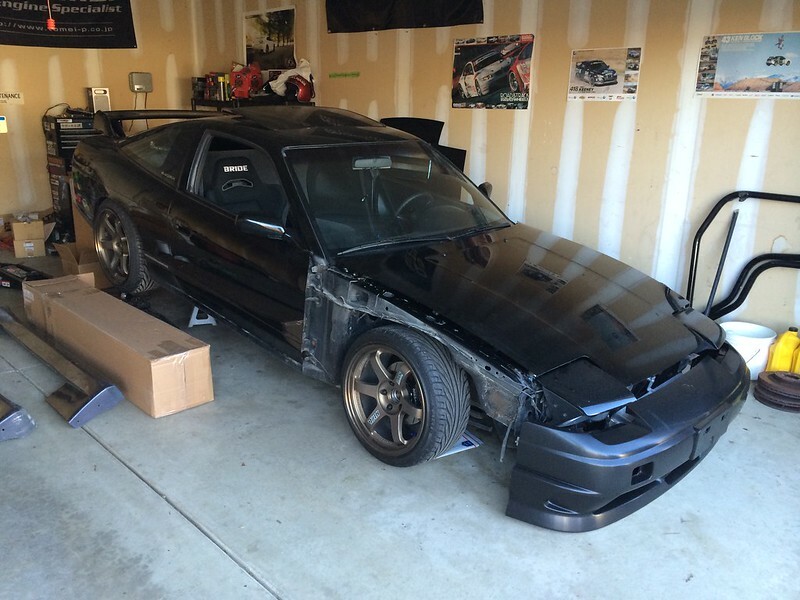 Since then I’ve managed to purchase another full kouki 180SX OEM aero kit, sourcing the front bumper and brackets from the always helpful Russell at NissanParts.cc. Fortunately I found an OEM front lip, side skirts, and a set of rear valences on Zilvia that should arrive within the next 2-3 weeks if all goes well. I’ll be installing another set of modified OEM front fender liners to clean up the fender wells once the OEM aero is painted and installed. It’s a more simple and less unique setup, but I think it’s the wisest choice overall. My arrival at the decision to run full OEM aero again was not without indecision. For a time my plan was to run a kouki front end with chuki side skirts, kouki rear valences, and a supermade rear wing. I even kicked around running a chuki front bumper with Xenon lip for a while purely because I rarely see a cool car with a chuki front end these days, but ultimately decided that going back to kouki aero was the only thing that was going to make me happy. I wanted to shake things up and do something a little less common, but just couldn’t bring myself to do it. Perhaps I’ll change my tune at some point down the road (as I often do) but for now I’m thinking OEM is the way to go. Inspired by simpler street-style 180s from Japan, I also decided to sell my Koguchi Power hood. The KP hood is one of those awesome pieces that I had always wanted to own, much like the Hot Road kit. Though the level of quality and fitment was a little bit worse than I expected, I did really like the aggressive look of it on the car. I’ll probably change my mind about this at some point down the road, but for now I’m enjoying the clean look and hassle-free install of the factory bonnet. I’d like to try a Hot Road hood someday as that is what I had originally ordered and ultimately had to cancel and replace with a KP hood after some importer issues. I was planning to sell my Ganador mirrors and run the factory units, but they just look so nice with kouki aero that I’ll probably hold onto them. Considering I’ve bought and sold no less than five sets of Ganador mirrors for my car over the years, this is a common theme. It’s probably worth holding onto them and using them. The last exterior change I’ve decided to make is the exhaust system. The Kakimoto catback looks a bit too aggressive for kouki aero in my opinion, so I decided to part ways with that as well. As luck would have it, I was able to track down my old TRUST DD catback and purchase it back. 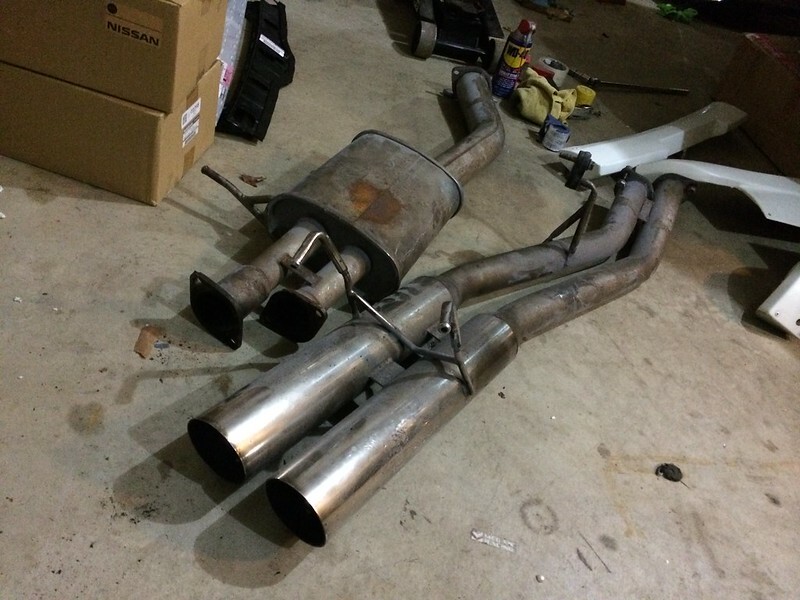 The exhaust hasn’t been used since I sold it back in 2012 and I feel really fortunate to get it back. I’m looking forward to picking it up today and installing it soon. I also scooped up an Apexi Exhaust Control Valve to help with the excessive noise from the car. I have to leave for my new job much earlier than my previous one and I don’t want to wake the kids up when I leave the house, so hopefully this does the trick. I decided to install a high flow catalytic converter to help with the noise and emissions a bit as well, so that will hopefully arrive next week. Hey, what can I say? I’m getting old. I also decided to part ways with my Do Luck floor bar and Defi Link Meter gauges to free up some funds for the aero changes and further tone down the interior. I’ll be picking up a clean dash locally this weekend to replace my previously cut up one. I’m sure I’ll add a couple of gauges again later at some point, but I got a good offer on them and couldn’t turn it down. 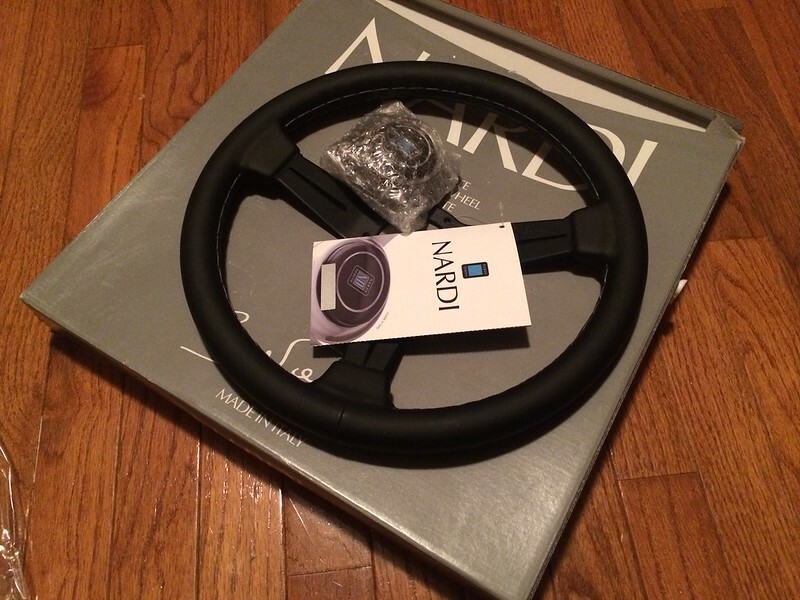 Lastly, my silver spoke Nardi Classic 330mm wheel was replaced with an all black version. One thing that has remained untouched is the engine bay. I need to replace my air filter, but otherwise I don’t really have plans for engine upgrades. I would love to do a similar S15 turbo setup down the road, but I’m enjoying the simplicity and reliability the car has to offer right now- not to mention that I don’t have the funds for a new setup. I’d like to add a radiator cooling panel and swap out my blow off valve, but those things can wait until later this year. As for the suspension and chassis, things are basically the same. I was tempted to change wheels a couple of times but couldn’t let go of my bronze TEs that took me so long to piece together. I picked up some replacement stickers for them as mine had seen better days and dropped to a 225/40 rear tire with a 5mm spacer. I need to remove some rear camber, but I’m a lot happier with the look now. Up front the specs have remained the same, but I ordered a set of S14 front lower control arms to widen the front track of the car slightly. I also picked up some Moog S13 ball joints and Energy Suspension bushings to freshen up the arms before installing them. Those items should hopefully all arrive next week. The deadline for all of these changes was April 24th for the WekFest show in Chicago. My friend Jimmy of the Houston, TX based team ~Essence~ is going to be in Michigan for work training that weekend, so we thought it would be fun to go to the show. But the more we thought about it and talked to our friends from the Chicago area, we decided that it would probably be more fun to drive an additional four hours up to US Air in Shawano, Wisconsin for Drift Day 57. Originally intent of taking Jimmy’s rental car so we could relax, I was finally convinced to sign up for Sunday’s portion of the event and try my hand at drifting for the first time. I’ve wanted to try some form of track driving with my S13 for years. Aside from two trips to the drag strip for fun I really haven’t done anything but drive the car on the street. I’ve always been wary of drift events because I really don’t want to damage the car, but everyone from the Club FR family has been so helpful and reassuring that I’ve decided to give it a try. With any luck everything will come together in time for the event and I can give it a shot. Stay tuned- I’ll try to update this with some progress soon!